We’re always excited to discover new ingredients for our DIY natural beauty toolbox, and this week we’re diving deep into the surprising array of offerings from the sea. Whether you’re a beach-lover or not, you’ll love the effects on your hair, skin, nails and teeth. Sea salt is rich in minerals including magnesium, calcium and potassium, and can be used for masks, scrubs, mouthwash or a soothing bath. Some brands also sell sea salt hair sprays to create that textured wavy look. Try mixing two teaspoons of sea salt with one cup of water and few drops of essential oils in a spray bottle for a DIY beach babe hair styling spray. Although this ingredient doesn’t sound the most glamorous, it was historically used by such beauty idols as Cleopatra and the Queen of Sheeba. Particularly black mud from the Dead Sea is believed to have therapeutic powers since it contains a high mineral content. Spa therapy centers use sea mud treatments to cleanse and detoxify the skin and body, relieve aches and pains and increase circulation. Health product companies sell pure mud, so try finding some for yourself and enjoy a face mask or bath soak, no additional ingredients needed. Tiny sea fauna like chlorella, spirulina and their lesser-known red and brown cousins have become increasingly popular in the skincare sector. Glamour magazine reports that 40 percent of millennials used a product containing algae in 2016. With a wealth of nutrients, like phosphorus, magnesium, copper, calcium, antioxidants and carotenoids, algae is known to combat skin aging, support even skin tone and promote healing. Seaweed is also proven to reduce inflammation and redness, fight aging and treat acne. See below for a mermaid face mask recipe using sea clay, seaweed and algae. Also known as French green clay, sea clay is a pale green powder which is known for its ability to detoxify and exfoliate skin while bringing down inflammation. Begin by processing 1/4 cup dried seaweed into a powder with your blender. Add one tablespoon each of spirulina and French green clay. In a separate bowl, start with a tablespoon of raw honey, then slowly add the green powder blend until a smooth paste is formed. Apply to the face and neck for 15 minutes, then rinse and pat dry to reveal glowing revitalized skin. Have you heard of thalassotherapy? This is the term used for health and beauty treatments done at seaside spa centers. To be able to use the official name, the facilities must use constantly refreshed “live” sea water which is believed to have the full benefits. So how can sea water make you more revitalized and beautiful? Thalassotherapy centers claim the pressure of seawater on the body, with its enhanced buoyancy, is therapeutic on its own. Seawater has a similar composition to the body’s plasma fluids, and trace minerals are believed to be absorbed into the skin by osmosis. Overall, seawater helps the body to replenish, heal and detoxify, so go for a salty swim whenever you get the chance. While there probably isn’t any scientific evidence, it could be argued, based on intuitive knowing and the common inclusion of the sea in art and literature, that sea air also has a unique re-energizing and beautifying power. Humans have always had a strong affinity with the sea and have gravitated there when a pick-me-up is needed. You’ve likely felt it yourself, standing by the seaside, with the engaging view, unique salty aroma and bracing cool spray — which might carry with it some of those valuable minerals, and contains negatively-charged hydrogen ions which are known to create a sense of well-being and vitality. While you can’t bottle sea air and use it as a cosmetic treatment directly, spending more time in a coastal environment will certainly invigorate and revitalize you. And if you love the feeling, look for a negative ion generator for your home. While the smearing, anointing and spritzing of various items is the obvious way to use them for aesthetic treatments, let’s not forget that beauty comes from the inside. Therefore, don’t overlook the consumption of these deep sea ingredients as part of your beauty routine. Both fish oil and cod liver oil are rich in omega-3 fatty acids and fat-soluble vitamins which are important for myriad body functions. This study reported that taking supplementary fish oil provides a protective effect from the sun, up to SPF 5, and reduces inflammatory responses in the skin. Another study included 1000 milligrams of omega-3 fatty acids EPA and DHA from ultra-pure fish oil concentrate in an anti-aging nutritional blend that noticeably improved measures of skin elasticity, radiance and hydration after eight weeks. Other research supports the consumption of fish oil for reducing acne, for growing thicker, healthier hair and for maintaining beautiful healthy teeth and gums. Some have also tried rubbing the fishy extracts directly onto skin. Writer Clare Goldwin, for the Daily Mail in the UK, reported on her n=1 experiment of piercing cod liver oil capsules and applying the contents to her face twice daily for one month. She also took one high-strength capsule orally each day. Follow-up computer scans at a cosmetic imaging studio after the 30 day period showed significant improvements in the evenness of her complexion (skin tone) and reduction in fine lines and wrinkles which were equivalent to “reverse aging” by four to five years. Yes, fish eggs. 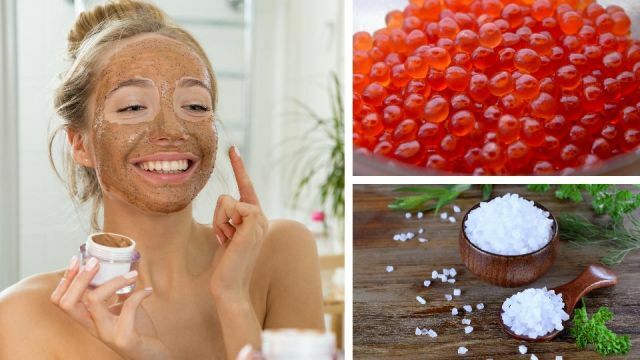 Some beauty product brands are now including caviar in their ingredient line-up, and for good reason, since it is rich in omega-3 fatty acids as well as vitamin A, vitamin E, vitamins B6 and B12, iron, magnesium and selenium. Whether you want to smear it on your face is up to you, but you can’t go wrong by incorporating some into your beauty-promoting dietary regimen. Saturate yourself in the potent minerals of the sea and you’ll be looking and feeling like a youthful mermaid in no time. Hey Buddy!, I found this information for you: "10 Sea Ingredients To Use In Your Beauty Routine". Here is the website link: https://www.thealternativedaily.com/10-sea-ingredients-to-use-in-your-beauty-routine/. Thank you.